When women experiencing abuse from a partner, husband or ex-partner need to escape, where do they go? They are at risk from someone who knows a lot about them: the abuser knows their family, their friends, the places they used to live, are familiar with, or always talked about visiting. For safety, they often have to go to the least-likely place – the place that the abuser would never think of – especially as an abuser may try and track them down. They may not have had any time to plan, so have to go wherever they can travel to and wherever they can find somewhere to stay. So we might expect a strong flow of women to major urban areas – an ‘escape to the city’ – away from rural areas where there are limited support services and less public transport, and away from small towns where women might fear being more easily noticed as a newcomer, and easier to track down. Public transport routes are generally cheaper and easier on the main routes into major urban areas, and more difficult, costly and infrequent in more rural areas. However, analysis of six years’ of administrative data for England shows the opposite: it is not that there are strong flows along transport routes, or to services in larger urban areas. 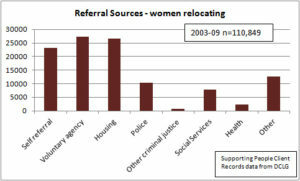 In fact, major cities are consistently places of net leaving due to domestic violence; with more women and children leaving each year to services elsewhere in the country, than the number who arrive to access services in the city. London has more women leaving every year due to domestic violence than the number who travel to London to access services, and the same is true of cities such as Birmingham, Leeds, Liverpool, Manchester and Newcastle upon Tyne. It is not an escape to the city after all. According to the United Nations, the United Kingdom has no Internally Displaced Persons (IDPs) or people in IDP-like situations needing protection or assistance by the UNHCR. But is that really the case? Displacement has many causes, but IDPs are generally caused by war and conflict, or by natural disasters, as well as by government policies such as large development projects, or by human rights violations. If a government adequately supports, protects and compensates such displaced persons, then it is not surprising that they do not come under the international concern of the United Nations. However, if, like refugees, they cannot obtain the security and well-being they need from their own government, then they become the concern of the international community. Violence against women is a form of discrimination and a violation of human rights, so are the women and children displaced by violence and abuse adequately protected, supported and compensated by the UK Government? Even if we only consider the women and children who go to formal services to escape domestic violence, we are talking about tens of thousands of people in the UK every year – Internally Displaced Persons. Are their human rights really being protected?